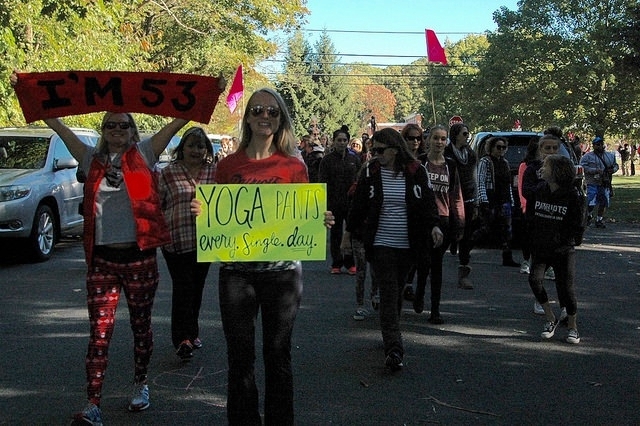 In case you guys missed it, last October, a whooole bunch of women organized and gathered outside a man's house to stage a yoga pants parade-slash-party. Why a yoga pants party and why do it at this man's front yard? Alan Sorrentino from Rhode Island wrote a letter to the editor of their local newspaper to express his strong feelings against women wearing yoga pants anywhere outside the studio or gym, calling it "the absolute worst thing to ever happen in women's fashion." He goes on to say, "Maybe it's the unforgiving perspective they provide, inappropriate for general consumption, TMI, or the spector [!sic!] of someone coping poorly with their weight or advancing age that makes yoga pants so weird in public." It's a pretty strong-worded letter with a not-so-polite suggestion for women to stop wearing yoga pants in public because yoga pants, as he put it, "do nothing to compliment a woman over 20 years old." 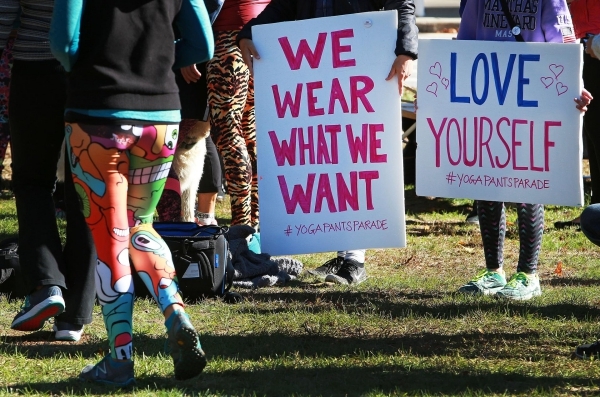 "While yoga pants seem to be a silly thing to fight for, they are representative of something much bigger — misogyny and the history of men policing women's bodies." It was a successful gathering, with hundreds of women and men turning up to join and support the peaceful parade to make a point. And as expected, the participants also had some group yoga fun — they're all already dressed for it after all! You can view more photos from the awesome event on Kerri Lemoie's Flickr.